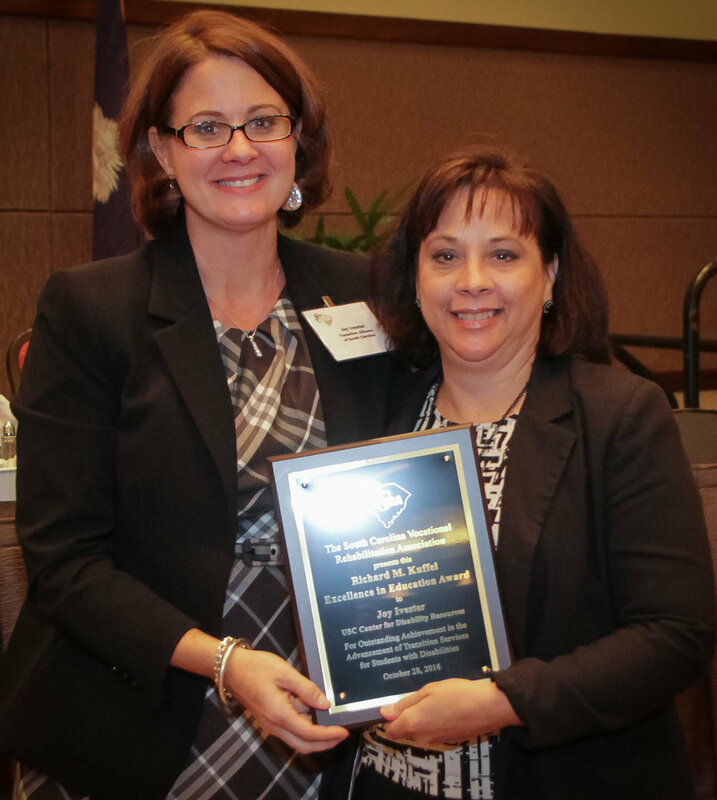 Joy Ivester (left), Transition Alliance of South Carolina Program Director, receives the Richard M. Kuffel Excellence in Education Award from Laura Spears, VR Transition Services Coordinator. Ivester received the Richard M. Kuffel Excellence in Education Award at the S.C. Vocational Rehabilitation Association’s (SCVRA) annual meeting on October 28, 2016. During her career, Ivester has expanded the Transition Alliance to the local level, with the result that SC now has 60 local interagency teams around the state that collaborate to increase successful post-secondary outcomes for students with disabilities. She is also a mentor, encouraging others to “take one more step” in changing the outcomes for youth with disabilities. SCVRA is a support organization for the S.C. Vocational Rehabilitation Department, which prepares and assists eligible South Carolinian with disabilities to achieve and maintain competitive employment.